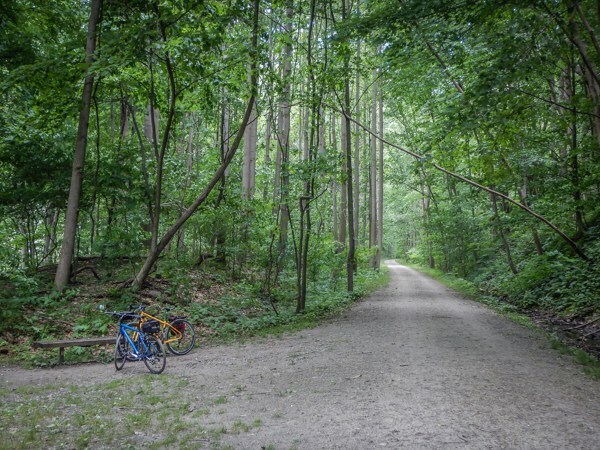 We consider this trail to be one of the most beautiful and spectacular rail trails in the entire country. We bike 150 miles from Pittsburgh, Pennsylvania to Cumberland, Maryland. The grade is gentle because this is a rail trail. 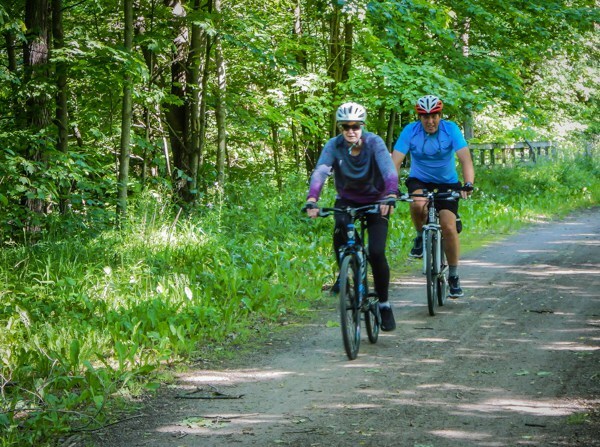 Our route allows us to bicycle directly to each of our overnight stays. At the end of the trail we van back from Cumberland to our opening hotel in Pittsburgh. This tour now includes a full day in the outdoor mecca of Ohiopyle. This allows us to take a tour of Frank Lloyd Wright's masterpiece, Fallingwater, included. 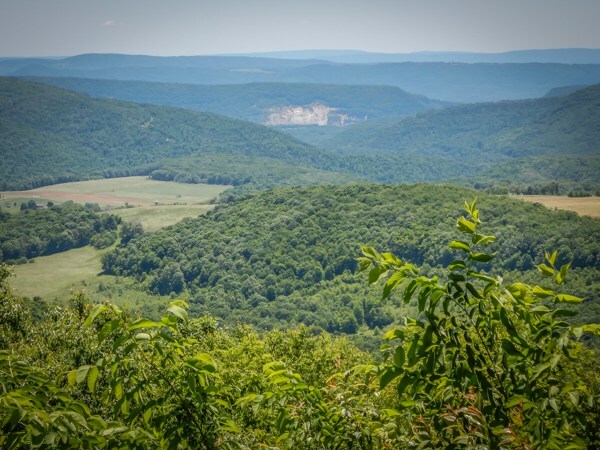 Some might choose instead to spend this extra day hiking nearby Fern Cliff Natural Area, or white water rafting the rapids of the Youghiogheny River. As we ride on the trail, leaving Pittsburgh, we pass remnants of giant steel mills. As the miles go by we slowly leave behind the industrialized areas and enter quiet woodlands and deep forests. We travel through tunnels, over bridges and viaducts, including the Salisbury Viaduct 1908 feet long, through the Savage Tunnel, 3294 feet long on an easy stone dust surface. The final day is a treat with the last 22 miles down hill to Cumberland. This is a very scenic and fun tour! Meet riders in Pittsburgh for our introductory meeting and dinner. 35 miles – Downtown Pittsburgh’s Point State Park is our starting point. It’s also the western terminus of the Great Allegheny Passage Trail. West Newton is our day’s destination. 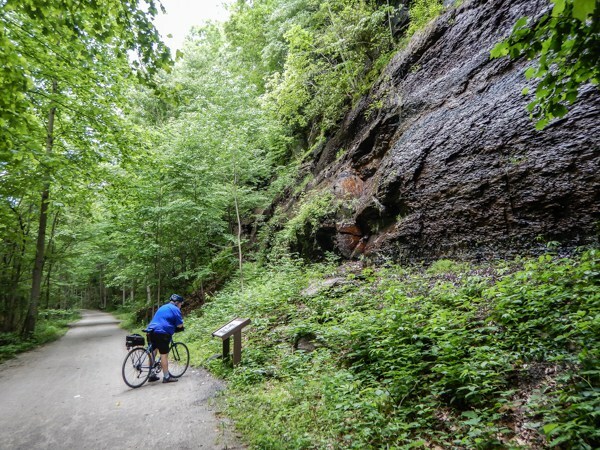 44 miles – Riding directly from our hotel, we cycle the beautiful trail and have lunch in Connellsville. Then we ride on to Ohiopyle, which is known for its beautiful rapids and white water sports. We spend the next 2 nights here. Take a tour of Frank Lloyd Wright's Fallingwater with us, or spend the day outdoors hiking, rafting or just hanging out. Ohiopyle is a center of activity for enthusiasts of adventure. 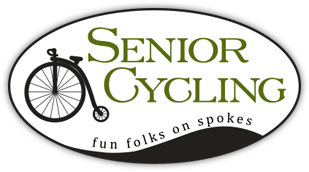 We won't have any scheduled cycling today, but feel free to do so! 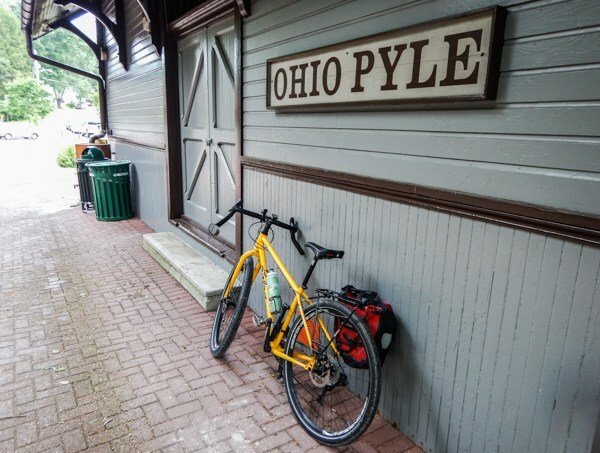 42 miles – We bike from Ohiopyle to Meyersdale with an early lunch stop in Confluence. We’ll bike over the Salisbury Viaduct into Meyersdale. 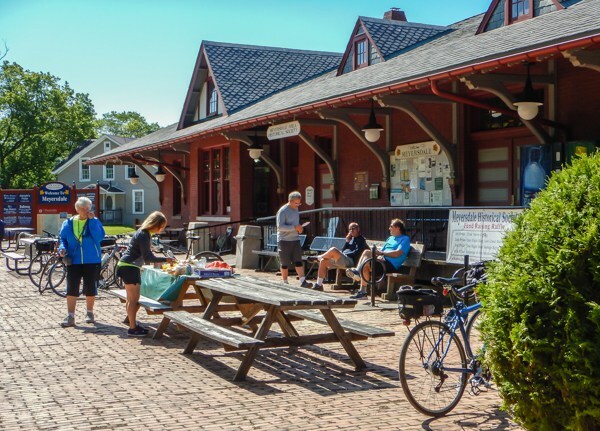 Don’t miss the exhibits at the Visitors Center at Meyersdale Station! 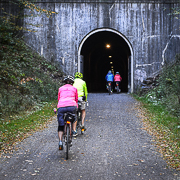 32 miles – You will cross the Eastern Continental Divide, ride through the 3,295-foot Savage tunnel and emerge to find a picnic area with a view of the surrounding hills and valleys. The trail finishes with a gentle and rewarding 22 mile downhill into Cumberland. After a quick lunch we will drive everyone back to our opening hotel in Pittsburgh. Some riders have continued on the C&O Canal Trail from this point to Washington DC, but we do not offer this as a tour. This tour’s trail is crushed stone. It is quite smooth and suitable for all bicycles. Larger tires will help to provide more stability, however. For this tour we meet riders at our downtown Pittsburgh hotel, 5:00 pm on Saturday, September 28th. The trip ends on Thursday, October 3rd. We will drive the van back to Pittsburgh with anyone needing to return to the hotel. We plan to be back at the hotel by 6:00 PM but we cannot guarantee this time since traffic delays are always possible. If you are driving, you drive to the hotel. You may leave your car there during the trip. Note: there may be a fee for leaving your car. Note: Some riders have parked their car in Cumberland, then traveled to Pittsburgh for our tour. At the end of the tour their car is waiting for them. A large public parking lot sits at the end point of our tour (Visitors Center for the C&O Canal in Cumberland). Also nearby is the Amtrak station, less than one mile away. And in Pittsburgh the Amtrak station is about 4 blocks from our hotel, making this a convenient option for traveling from Cumberland to Pittsburgh. Other riders have said goodbye to us in Cumberland and continued riding on the C&O Canal to Washington DC, about 185 miles away. We will do our best to accommodate your specific needs. Your night’s lodging on Saturday, September 28 through Wednesday, September 2 is included. Your night’s lodging on the day the trip ends (Thursday, October 3) is not included. That night is at your expense and reservations for that night are your responsibility.